This first-floor apartment and is 90 m2. If you look at the selection of photos, you will see a floor plan with the layout. It faces northeast and has its own private access from the parking area. It has two bedrooms, one with a double bed and the other with two single beds. It offers a spacious lounge/dining room with a TV, and sofas. The kitchen is equipped with everything you need. There are two complete bathrooms. One is an en suite bathroom in the master bedroom, and the other is situated across the hallway from the first bedroom. Outside areas within the grounds: beautiful garden and orchard of 1500 m2, children’s play area, barbecue and car park are all communal áreas. Centralized water heating, Double-paned Windows, Television. Change of bedding and towels once a week. Ceramic stovetop, Microwave, Blender, Juice squeezer, Toaster, Water heater, Fridge and freezer, Kitchen utensils, Dish soap, Sponges, dishcloths (new), Table cloth, Napkins (new), Kitchen roll (new), Kitchen towels. Coffee maker and filters, Ice bags. Hair dryer, Soap/hand wash, WC paper. Baby cot with bedding, High chair and baby bath, Children’s play area. Washing machine, Washing detergent and fabric softener, Awning for air-drying clothes, Iron and ironing board. 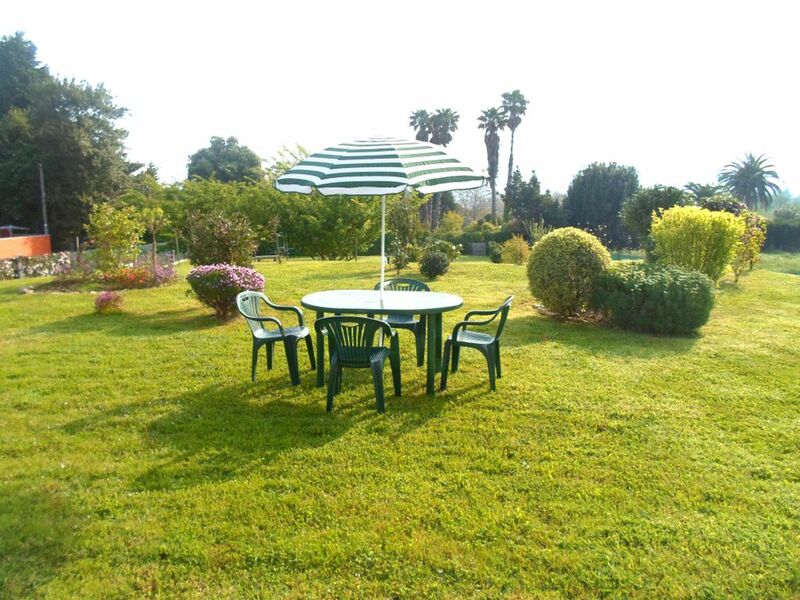 Beautiful garden and orchard of 1500 m2, children’s play area, Tables and chairs, Parasol, Parking within grounds, Barbecue, Daily rubbish collection. My name is María, and I would like you to know I pride myself in making my homes and your stay very personalised. I go that extra mile to be able to offer all the information necessary about the homes and the area I live in, not to mention tourist information and advice on what to see or where to visit in this most wonderful and precious area. My guests range from families with or without children to couples or friends, guests that look for that relaxing, serene type of holiday, exploring fascinating new places and enjoying the food and drink from the Rias Baixas. I live nearby and visit every day to check on the installations, attend to the gardens and of course attend to any of my guests´ needs or queries. I am available at any time, and I will always respect your privacy. There are some house rules that must be followed to ensure that at all times, all the guests enjoy a peaceful and tranquil stay. It´s a very well-secured country home, situated in the province with neighbours nearby. The nearest village is within walking distance. It´s only 900 m away. In Vilalonga you´ll find banks, bars, supermarkets, chemist/pharmacy, small shops and a petrol station. The nearest beach, Playa de la Lanzada, is 2400 m or 5 minutes away by car. This Blue Flag rated beach has 2 km of fine golden sand and plenty of parking space. Also, there are fantastic access routes to the motorways using either Salnes AG-4.1 (5 km away) or the A-9 (10 km away). Upon greeting my guests, I ensure they are given information, pamphlets and maps of all the places they can visit in the area. On my website, I give you a little bit of information because I think it´s a good idea that you familiarise yourself with the areas beforehand. Within 6-8 km, you will find other villages called Sanxenxo, Portonovo, El Grove, La Toja, San Vicente del Mar and Cambados. Just 8 km away, using the motorway, you will find bigger cities, such as Vigo and Santiago de Compostela. You are only 100 km from the Portugal-Spain border. Along the coast, you can also take a boat across to the absolutely stunning islands of Cies and Ons, or you can drive across to Arousa or La Toja. To get to my house, I will send you Directions upon entering the province of Galicia with The exact location on Google Maps and The exact GPS coordinates. My name is María, and I would like you to know I pride myself in making my homes and your stay very personalised. I go that extra mile to be able to offer all the information necessary about the homes and the area I live in, not to mention tourist information and advice on what to see or where to visit in this most wonderful and precious area. your stay very personalised. free wifi, parkig private. These apartments are spacious with everything needed for a family or couples. They are scrupulously clean. Maria is a delightful lady, offering lots of advice on the surrounding area. She is extremely helpful. We recommend this property very highly. appartement exceptionnel et propriétaire accueillante sincère chaleureuse et professionnelle. Galicia en una región hermosa donde predominan los bosques y las praderas de hierba verde. Eso viene propiciado por las frecuentes precipitaciones. En las Rias Baixas en esta época las temperaturas son suaves y yo hago que los viajeros siempre dispongan de lo necesario para que su estancia en mi casa sea placentera sea cual sea la temporada. Es una región muy propicia para amantes de la naturaleza. Es un sitio maravilloso para descansar con los niños, la finca aparte de ser preciosa y estar muy cuidada es cerrada y pueden jugar libremente sin correr peligro. Sus dueños son encantadores y te facilitarán todo lo que puedas necesitar. Gracias por hacernos sentir como en casa! Es una casa tradicional donde todo se hace con esmero y por el placer de hacer las cosas bien, sin prisas, a la antigua usanza. Donde cuentas como persona y como tal eres tratado. Die Wohnung ist groß und sehr gut eingerichtet, der Garten mit Spielsachen ist wunderbar und für Familien mit Kindern hervorragend geeignet. Die Lage ist (für Besitzer oder Mieter eines in der Region sowieso unablässigen Pkws) perfekt: nah an mehreren wunderschönen und sehr unterschiedlichen Stränden, zentral auf der Halbinsel, so dass mehrere kleine Örtchen und schöne Städte mit vielen gastronomischen Angeboten in Fahrtnähe sind. Die Vermieter sind wunderbare Gastgeber: Gut vorbereitet, herzlich und hilfsbereit. Nous avons séjourné 10 jours dans cette belle région de Galice dans l’appartement de Maria et de son mari qui nous ont accueillis très chaleureusement. Le logement est très bien situé, dans un lieu calme (ce que nous recherchons pour les vacances), peu éloigné des plages et des nombreux sites à visiter. Il est tout à fait conforme au descriptif, très grand et d’une propreté irréprochable. Nous n’avons manqué de rien, tout est prévu. Was a really pleasure had this amazing frech family in my house. They are so kind, lovely and friendly.I feel so happy when I lisent this comments, I always try to help my guests in all the things I can. My main aim is you enjoy your holidays. I recommend this family and I hope to see them again in the future. (Text automatically translated) The very easy acces to the highway exit AG.4.1 is 2 km and the House are spacious and well paved roads. (Text automatically translated) In a radius of 6 or 8 km approximately populations are Sanxenxo, Portonovo, The Grove, LaToja, San Vicente del Mar and Cambados.Estamos in the heart of Rias Baixas. At 80 miles per highway is Vigo and Santiago de Compostela, and 100 km border with Portugal (to 45m.). Se le recibe personalmente y se le informa detalladamente de la casa y del entorno.Le informo sobre la ubicación de los lugares mas relevantes con mapas y folletos para que su estancia sea lo mas aprovechada y cómoda posible. Se le asesora y ayuda en todo lo posible para reservas de actividades y eventos. La atención personalizada se realiza durante toda su estancia. Todo ello incluido, sin sobre costo.